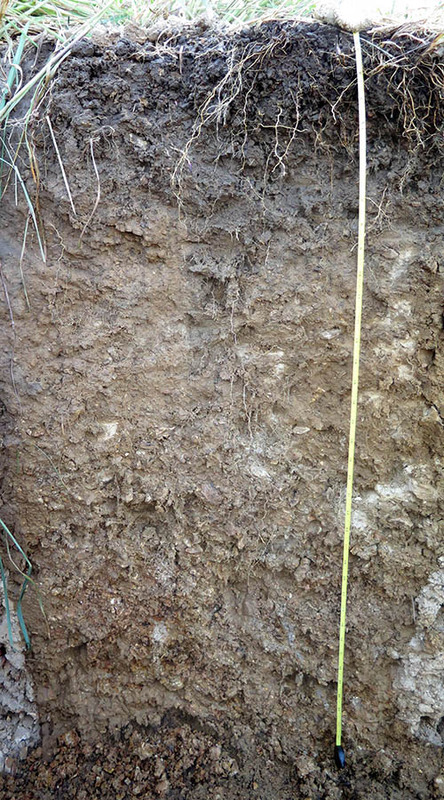 We climbed down in the hole and began to look at the soil profile. We began to notice that roots were commonly growing down to 3 feet deep. In contrast to a fescue field, in which the bulk of the roots end at about 1 foot, these were impressively deep roots. But how would this relate to the easy digging that the backhoe man noticed? The deep roots made us think back to the results of a couple soil tests we had taken earlier in the summer; we had sampled in fescue fields and also native fields. We found an interesting observation in the organic matter data. While the organic matter in the soil samples taken from a depth of 0 to 8 inches in both the fescue and native fields were very similar (around 4.0%), we found that the samples from 8 to 12 inches were not similar. 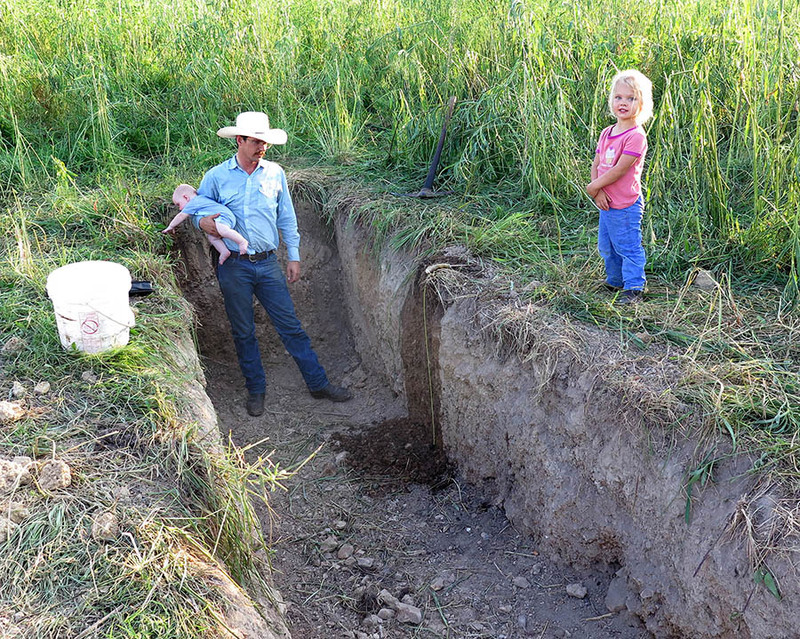 The soil from the fields growing natives was 44% higher in organic matter at this depth (the fescue fields averaged 1.7% while the natives averaged 2.45%). While our samples didn’t constitute a full-fledged scientific study, the results made sense in the light of the soil pit we were looking at. Deeper roots in the diverse native grassland would contribute to more soil organic matter since after all organic matter is just partially decomposed plant and animal (think microbes) material. The fescue plants, since their roots are fairly shallow, would have a hard time producing organic matter at deeper depths. As we contemplated this data, we thought back to the backhoe man’s easy digging comment. If indeed the roots are growing deeper and organic matter is being formed deeper in the soil, the effects could be far-reaching. The soil could hold more water and nutrients for the plants to use when needed, and the plants will be able to explore more of the soil searching for water and nutrients. Paired with our observation that the infiltration rates on the diverse native grassland are a lot better than a fescue pasture (if you haven’t read this article, check it out here), this could not only help the plants and other soil life but improve the water cycle. Could the kids growing up today be able to once again fish and swim in the creeks that their grandparents did?